The extraordinary rise of Ethiopia as a destination and a transfer hub for long-haul travel to Sub-Saharan Africa has been revealed in the latest findings from ForwardKeys which predicts future travel patterns by analysing 17 million flight booking transactions a day. 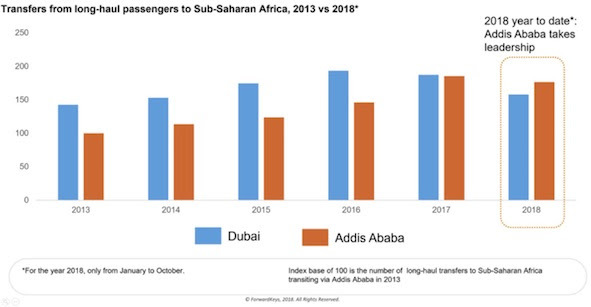 The data shows that Addis Ababa (Ethiopia’s capital) has grown its volume of international transfer passengers to Sub-Saharan Africa, five years in a row (2013-17). It also highlights that Addis Ababa’s Bole airport, which is currently being upgraded with a new terminal, at the cost of $345m, has overtaken Dubai as the leading gateway to the region, based on this measure. 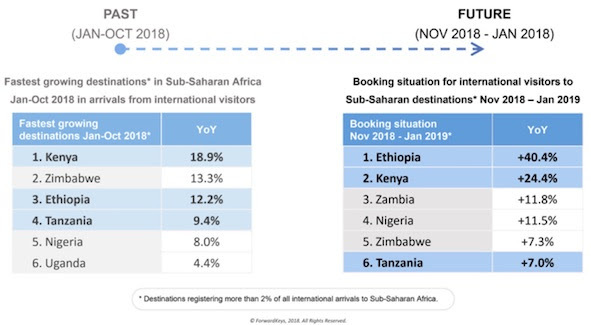 At least some of Ethiopia’s increase in international flight bookings is being attributed to new-found confidence in the wake of reforms carried out by Prime Minister Abiy Ahmed since he took office in April. These include signing a peace deal with Eritrea in July, a new e-visa policy introduced in June, which allows all international visitors to apply for a visa on line and a promise to open Ethiopia’s markets to private investment. ForwardKeys points out that one of the major opportunities for destinations in the region is to relax visa regimes for international travellers. An example is given for the Chinese market, which is now the strongest in the world by numbers of people and by expenditure. According to ForwardKeys data, liberalised visa policies had a transformative effect on Chinese tourism to Morocco and Tunisia in recent years, dramatically lifting visitor numbers.